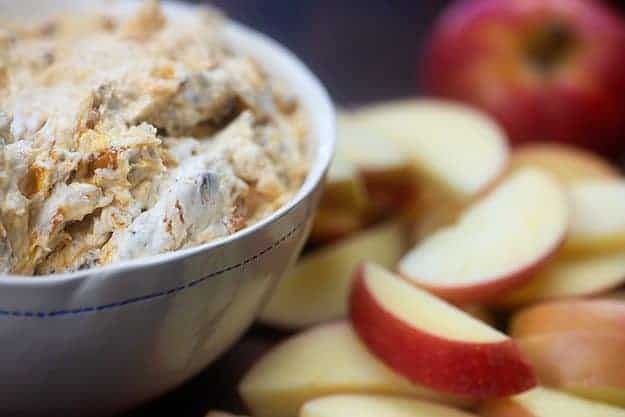 Marshmallow fruit dip mixed up with Butterfinger candy bars! 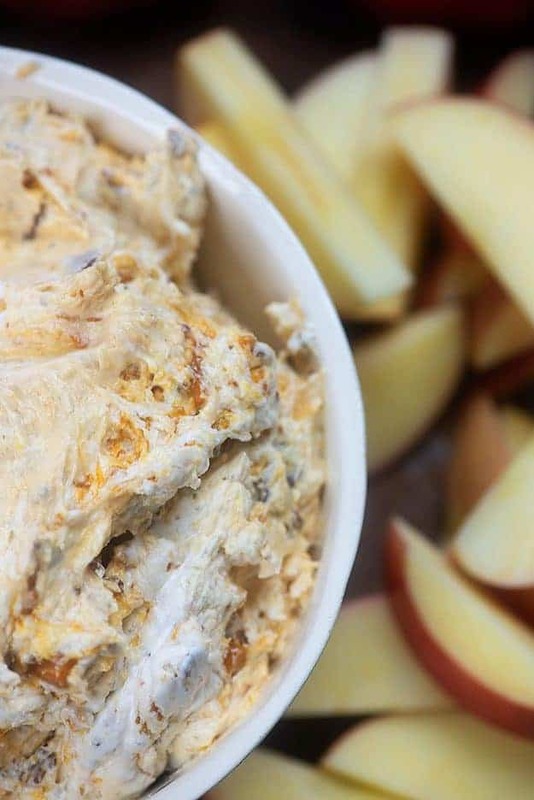 You won’t be able to stop dipping those apples in this easy fruit dip! You know, I really think that there should be some sort of test before becoming a grown up. This whole arbitrary 18 years of age thing is crap. I’m in my mid-30s, married with children, have 2 dogs, regularly have to color my hair to hide the gray, and from the outside looking in, I probably appear to be a proper adult. Then I get on the internet and show you how ridiculous my life is. Like, for my work, the thing I am paid actual dollars to do, I chop up full size candy bars and put them in a mixture of cream cheese, cool whip, and marshmallow fluff and then I feed it to my people on the end of apple slices and graham crackers. Someone needs to come and take away my grown up adult membership card, because clearly I am a three year old. Candy bars! In my fruit dip! I just feel like that is not something a grown up should be doing. Life as a mad scientist candy experimenter is good, y’all. I highly suggest creating fruit dip recipes for a living. To start, grab a few Butterfinger candy bars. 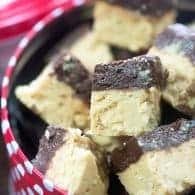 You can use 3 full-sized candy bars or about 12 fun-sized candy bars. 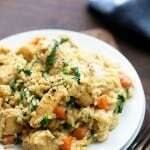 Chop them up with a sharp knife or pop them in a blender or food processor. 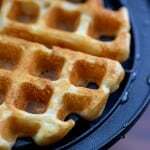 Next, add marshmallow fluff, room temperature cream cheese, and Cool Whip to a mixing bowl and grab your mixer. Beat these together until they’re combined and fluffy. Add in your Butterfinger pieces. Start thinking about how excited your children are going to be when you serve them this cream cheese fruit dip. Because Butterfingers. Mix it all up again and grab a few apples. 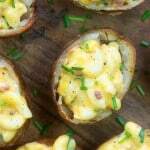 Slice ’em up and serve them with the fruit dip. Graham cracker slices, grapes, berries, Ritz crackers – all of these are acceptable dipping tools. Live your life to the fullest. Enjoy that dip. This fruit dip recipe should last about 5 days in the fridge, but I’m guessing you’ll devour it long before then. 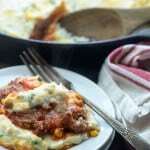 7 Layer Dip: A classic and always a hit! 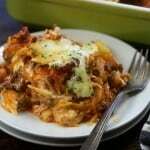 Spicy Chicken Dip: Perfect for game day! 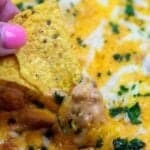 White Queso Dip: No Velveeta in this one and it’s SO easy! Best Spinach Artichoke Dip: Is it even a party if you don’t serve spinach artichoke dip? 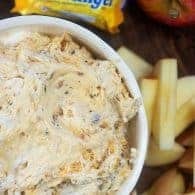 Butterfinger candy bars get blended up and added to this light and fluffy fruit dip for a delicious after school snack that is perfect with apple slices! 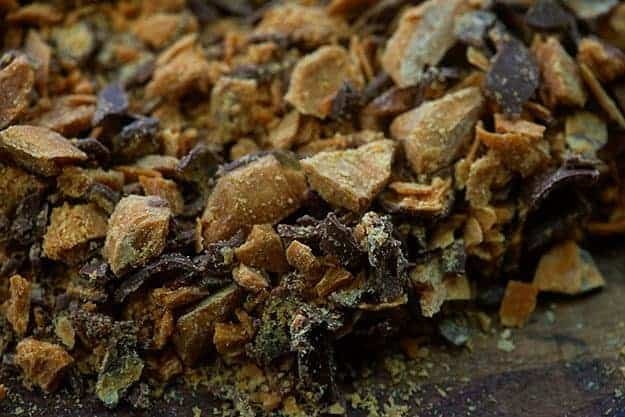 In a blender or food processor, finely grind the candy bars. Alternately, put them in a sealed bag and beat them with a mallet until crushed. In a large bowl, beat the cream cheese and marshmallow fluff until light and fluffy. Fold in the cool whip and all but a handful of the candy crumbs. Spoon dip into a serving dish and sprinkle the remaining candy over the top. 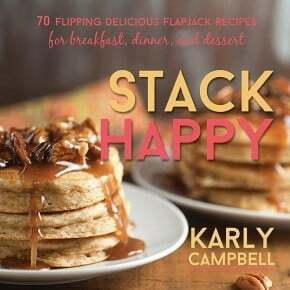 Serve with apple slices and graham crackers. 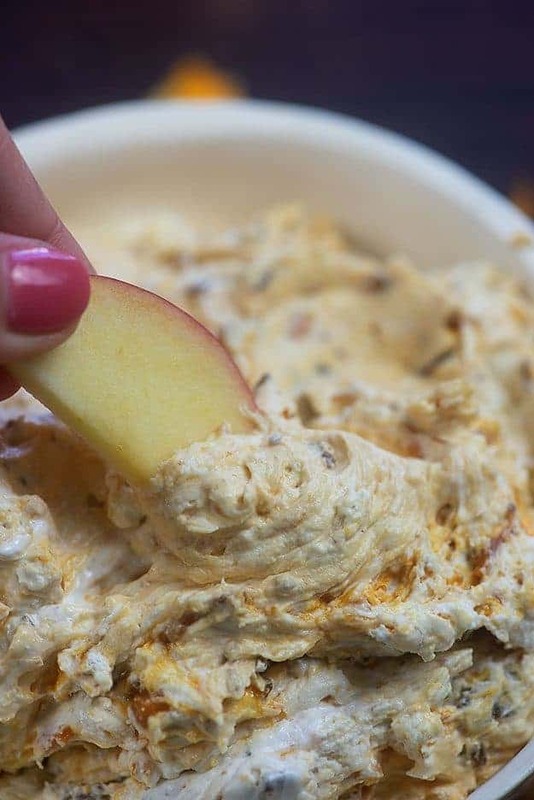 This easy fruit dip was first published in January 2014. It’s been updated with new photos and a video. 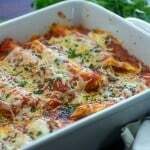 The recipe stayed the same because it’s perfect as it is. 😉 Original photo above. Nonono, I don’t want anyone to take away your grownup membership card! 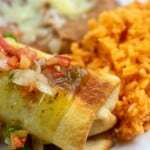 Then we wouldn’t get over the top deliciousness like this! This has all of my favorite things…in a soft and dip-able bowl. Plus, if I dip apples into it, I can pretend it’s healthy. Win win. 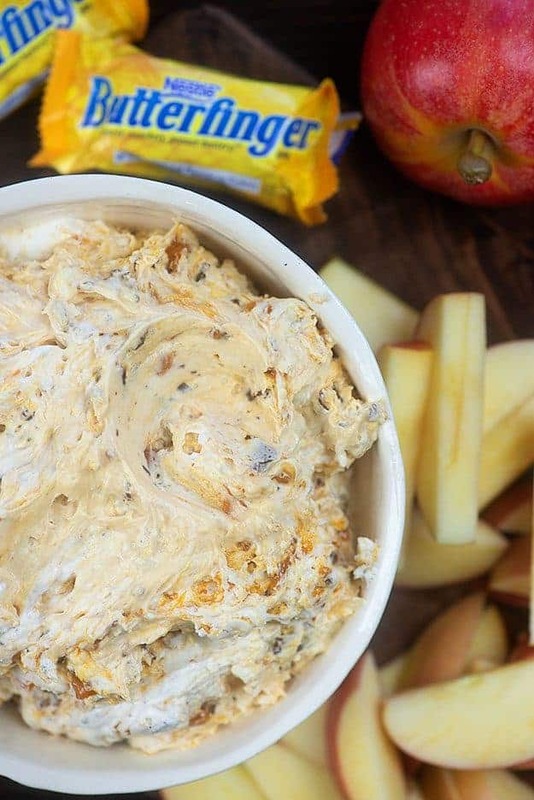 Love this butterfinger dip. Pinned! 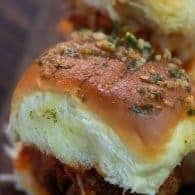 I think this is one of the great uses of a food blog; it allows you to become a kid again and experiment every time you cook. This means sugar, cheese and all the delicious thing we were told not to eat. No! If you’re adult membership is revoked, it won’t be long for the rest of us!! This dip looks sinfully delicious! Lord have mercy. You are killing me today. Killing me. Fluffy fruit dips are my weakness and this one looks amazing!! Butterfingers are one of my favorite candy bars ever! Love this!! YUM! SInce you can have fruit with it this totally counts as a healthy snack =) LOVE IT! “I’m not ready to be an adult either,” I say as I write the proposal for my senior thesis research and apply for internships. But if turning candy bars into dips is apart of adulthood, I’m totally into it. If not, I’m down with that as well. 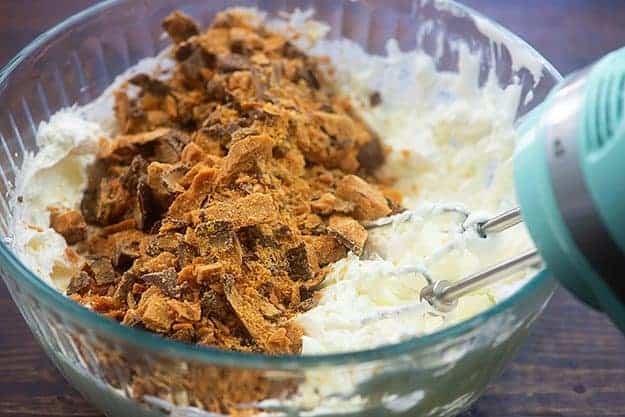 Candy bar dip = genius. Pinning! Hello from Iowa 🙂 Love your above comments!!!! Last week I had to make mac and cheese for work. It was awesome. And I didn’t even dip fruit in it! Oh my gosh! Let’s all be kids together while we fight over a bowl of this!! I’m pretty sure this is the most amazing thing I’ve ever seen. Instant craving! 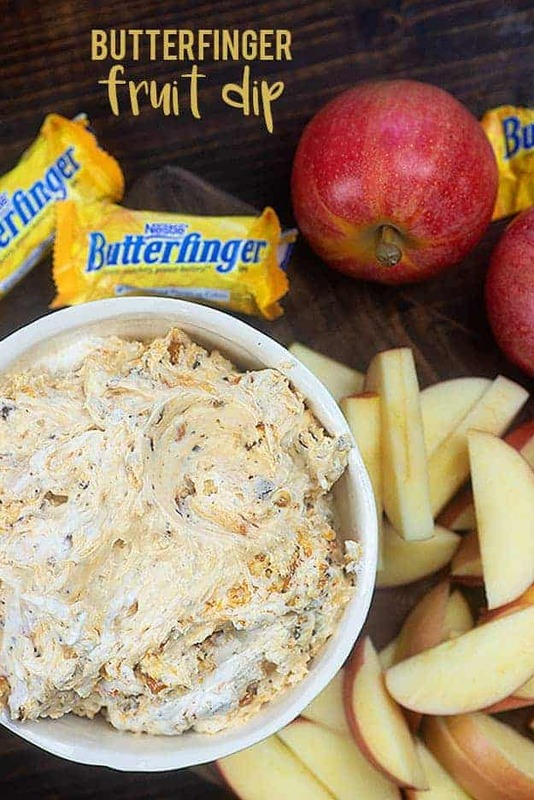 Who cares about being an adult when you have Butterfinger Dip to munch on? Seriously!!! This is amazing!!! I tried this and it taste like a miracle. Is it 7 oz by weight or by measurement? I know that’s probably a silly question. Hi there! I just used a 7 ounce jar of Fluff. I imagine that is by weight, but I don’t for sure. 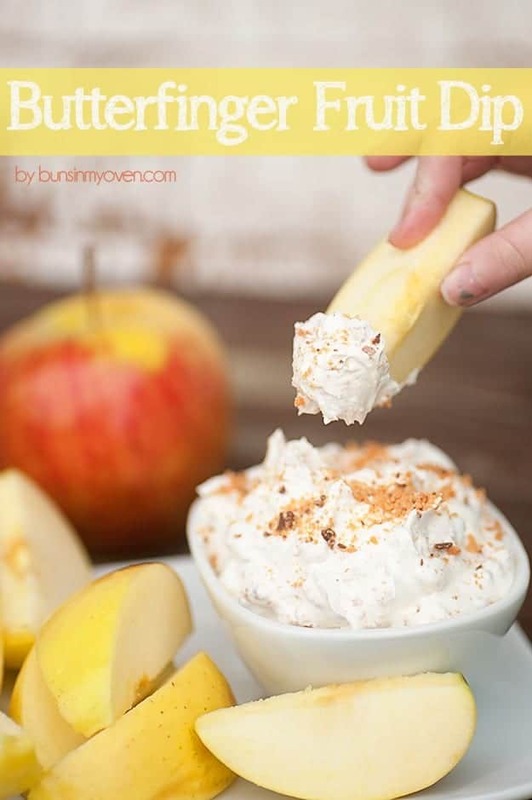 Sounds yummy….ranks right up there with a recipe I found for your basic apple salad with Snicker bars cut up in it. Delish!! I am assuming that by marshmallow “Fluff” you mean marshmallow “crème”? Excellent Masterpiece. I have a Sweet Tooth but this is Light. Girl, you are a something else for this one. I absolutely have to try it! Lol, I feel that way all the time. Like when I’m making single Oreos into double-stuffed Oreos as an afternoon snack or feeling tempted by Ecto cooler at the grocery store. It’s like, how am I an adult?! This looks amazing! 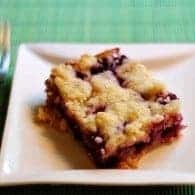 I’m not always a fan of fruit-based desserts, but this one clearly deserves an exception! Thanks, Karly! Butterfingers are my absolute fav! This looks amazing! !